Diwali – the Festival of Lights – is a five day festival celebrated by Hindus in India and all around the world, which began this year on the third of November. During this period, people clean their homes and open their windows so that the Hindu goddess of wealth, Lakshmi, can enter. It is believed that she can only enter houses that are lit up, so special clay lamps called ‘diyas are burned to light the way for the goddess, hence the name – Festival of Lights. 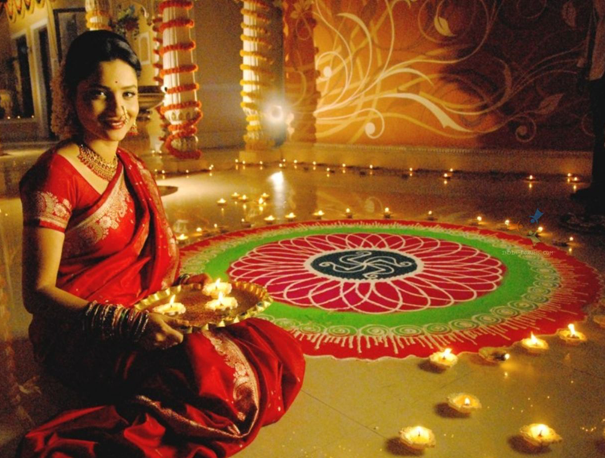 It is also common for a pattern called a ‘Rangoli’ to be drawn on the ground, to welcome Lakshmi, sometimes created with coloured rice, flour, sand or flower petals, as seen on the right. 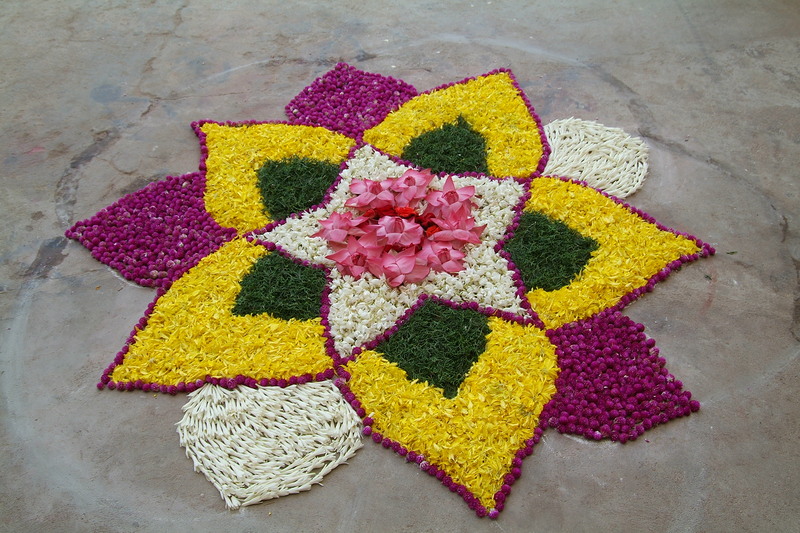 Rangoli designs are usually circular in format, with elements based on geometric, flower or petal shapes. 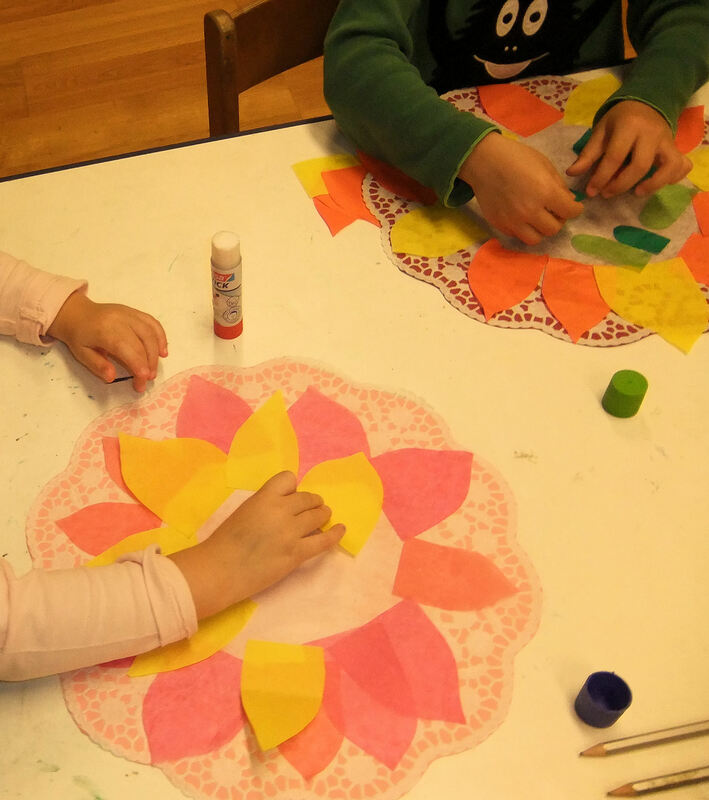 I thought the children would enjoy making their own artworks inspired by beautiful Rangoli patterns. 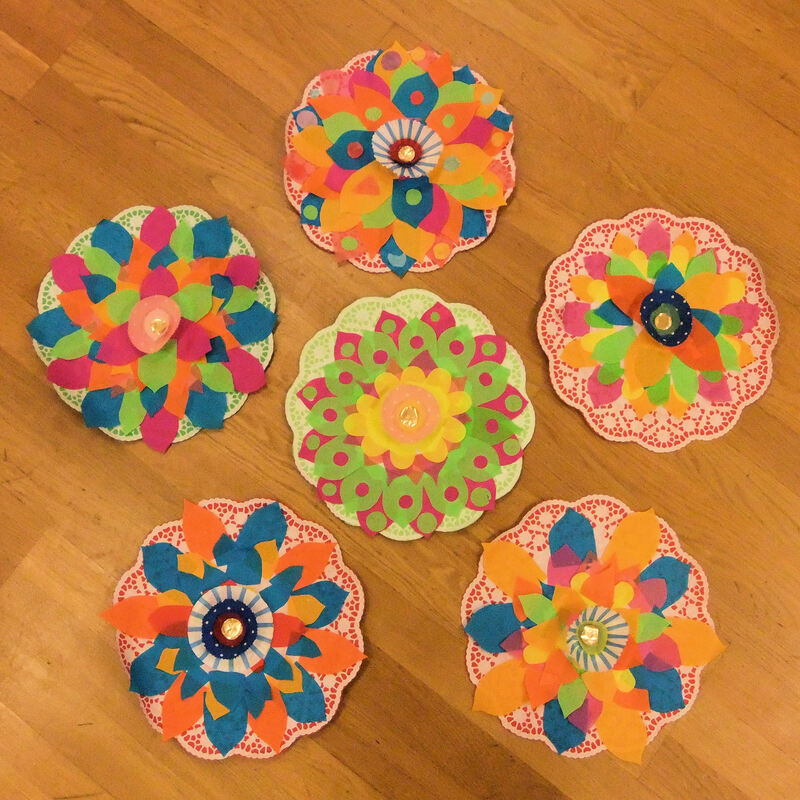 I gave each child a paper doily, which I had spray-mounted onto colour paper beforehand to make it more robust. 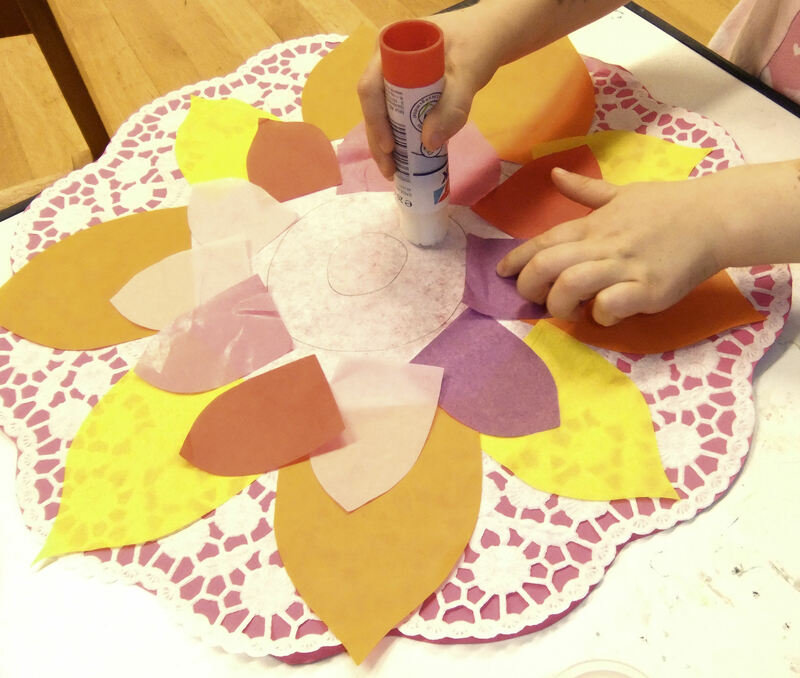 Instead of using real petals, I pre-cut petal shapes from tissue paper in a range of colours and different sizes. 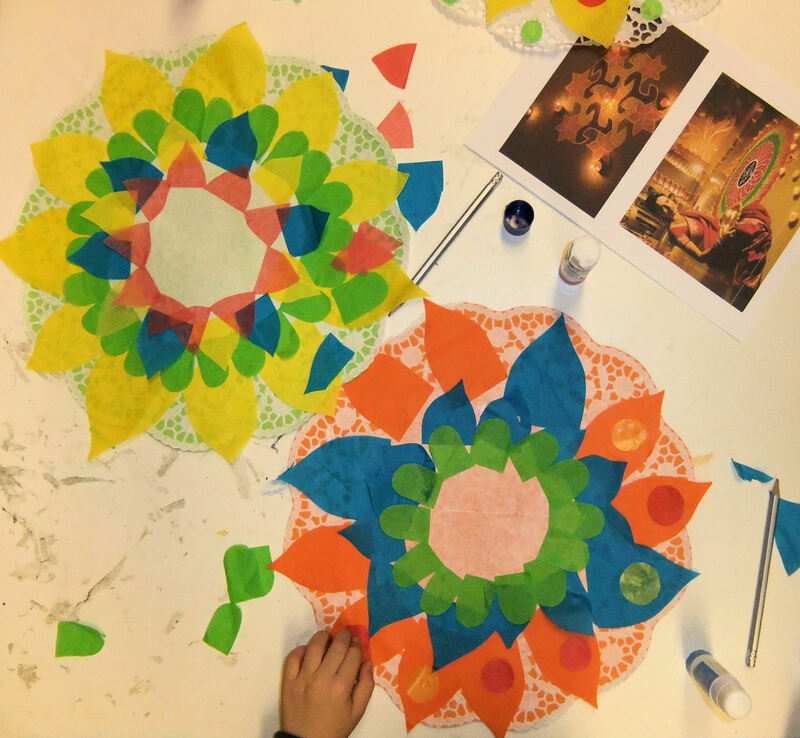 The intricate lacy edges of the doilies provided pretty frames for the Rangoli patterns, as well as helping the children to compose their patterns of tissue paper petals in concentric circles, starting from the outside and working inwards. For the younger group (aged 3-4) I drew concentric circles in pencil on each doily, to help them line up the tissue paper shapes. Glue stick was applied first, in circles, so that each layer/ring of petals could be arranged in one go, without getting into a sticky mess! I encouraged the kids to create repeating patterns, by selecting only one colour per ring, or alternating two or three colours in order. It was also important to try and overlap each layer of petals to avoid too many white spaces between the shapes. Some of the children added spots of colour to make their patterns more elaborate. 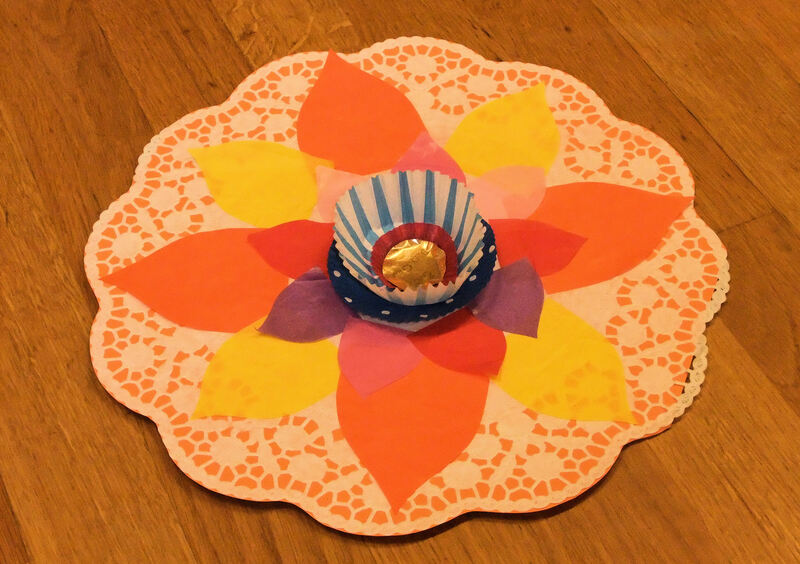 Everyone finished off their Rangolis with colourful cupcake cases, adding a disc of gold paper in the centre to look like the little flame inside a ‘diya’ lamp. We decorated the floor of the art room with the children’s Rangolis, each of which turned out to be beautiful and unique. I think they capture the spirit of this ancient artform. Happy Diwali! I am ten years old and I like what you did with flowers, but next time could you do something for older kids?